Headaches are all too common. Nearly all of us experience them at some point, and many suffer from repetitive headache disorders. Up to one in 20 adults lives with a headache daily. The National Headache Foundation estimates that over 45 million Americans deal with chronic, recurring headaches. Headaches can be caused many different ways, with over 150 diagnostic categories established. They may be due to sinus pressure or infection, tension in the head or neck muscles, hormonal changes, or migraines. They can also be caused by dehydration, environmental allergies or food intolerances. Considering how many of us deal with headaches on a regular basis, often caused by unknown factors, it’s common to have pain-relief medications on hand at all times. These might include ibuprofen (Motrin, Advil), acetaminophen (Tylenol) or ASA (aspirin). More serious conditions may be treated with opioids containing narcotics like codeine, or glucocorticoids, which are a type of steroid. Migraine sufferers may even be on a steady schedule of drug intake in an effort to prevent future episodes. Although using pain relievers in the short term to treat acute pain is perfectly fine, and often necessary, frequent or long-term use can lead to serious complications. Pain-relieving analgesics and anti-inflammatory drugs can cause ulcers, gastrointestinal bleeding, or a different type of headache from overuse of medication. Narcotics are habit-forming, and steroids carry a risk of toxicity. Other migraine treatment drugs increase the risk of strokes and heart attacks, or worsen nausea and vomiting. Since using medications brings significant risk factors, it is always worthwhile to try natural remedies first. Stronger medical interventions can always remain as a last resort. One natural modality that has been found to be particularly effective is essential oils, used aromatically (by inhaling) or topically (by applying to the skin). A 1995 study where peppermint and eucalyptus oils were applied to the forehead and temples of headache sufferers found that “a significant analgesic effect” was created by the oils. The study authors concluded that the essential oils “exert significant effects” on headache mechanisms. Another study done in 2012 used lavender oil to treat migraine headaches. The researchers recorded that 92 out of 129 migraine sufferers responded positively to treatment with lavender. The lavender group not only reported a 74 percent improvement in the severity of their symptoms, they also reported significantly fewer migraines than the placebo group. These figures can be compared to powerful migraine drugs given by injection, which have a 70 percent success rate, and Tylenol and Ibuprofen, which have exhibited 50–57 percent effectiveness for migraines. This evidence is certainly strong enough to support experimenting with essential oils before popping a potentially toxic pill. Tension headaches are most common in the developed world, where they affect more than 30 percent of men and more than 50 percent of women. Tension headaches are caused by unconscious or subconscious contraction of muscles in the head, neck and jaw, leading to chronic pain. Basil essential oil is a go-to remedy for tension. Its bright pungent scent is refreshing and the plant constituents function as muscle relaxants. Migraine headaches are quite common, with at least one in every seven adults experiencing them. Women suffer from migraines more than men; this disparity is thought to be caused by hormonal differences. Migraines are often observed to begin in puberty, and are experienced by adults most often, but can also affect children. Another common trait of migraines is that they may follow on the tail of a stressful event. Stress hormone levels (such as cortisol) rise to get through the event, but then when they fall, a migraine results. As discussed above, lavender has proven itself as effective for treating migraines, with its active chemical components acting in an analgesic (pain-relieving) and anti-inflammatory capacity. Sinus and allergy headaches are another common type. Peppermint oil helps improve circulation and clear congestion to relieve pain and pressure. Try this all-purpose headache relieving concoction to help with any type of headache. It contains the most effective oil varieties we’ve discussed, in addition to a few others, which help soothe stress and bring down inflammation. Start with a 5 ml roll-on bottle or glass bottle. An empty 5 ml essential oil bottle will work beautifully if you don’t have the roll-on bottle. Add the essential oils to the bottle—they will add up to about 3 ml. Top off with perfumery alcohol or a light carrier oil of your choice. Pleasant options are grapeseed or apricot kernel. Next time you’re reaching for your headache meds, try essential oils as a first step. There is no harm in experimenting, and you may just find they do the trick! 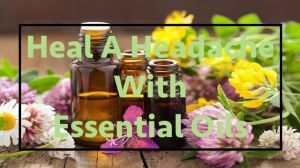 Hey Buddy!, I found this information for you: "Essential Oils For Every Type of Headache". Here is the website link: https://www.thealternativedaily.com/essential-oil-headaches/. Thank you.